Mayfair Kaikoura accepts Visa and MasterCard. The Mayfair Kaikoura reserves the right to alter any and all fees from time to time and without notice. Allocated seating is not available and the session is a general admit. Please be at the cinema in time for your session and to choose your preferred seating option. Kids under 5 are free. A 3D glasses hire fee is still applicable. Where tickets requiring identification are purchased, suitable identification (valid NZ ID includes: passport, driver’s licence, HANZ ID, Student ID, Gold Card) must be presented upon collection of the tickets. If you do not receive a confirmation number (in the form of a confirmation page or email) after submitting payment information, or if you experience an error message or service interruption after submitting payment information, it is your responsibility to confirm the Booking. Only you may be aware of any problem that has occurred during the purchase process. Mayfair Kaikoura will not be responsible for losses (monetary or otherwise) if you assume that an order was not placed because you failed to receive confirmation. Your Booking confirmation will be sent via an email to the email address that you entered on the Booking Confirmation page. This confirmation needs to be printed and shown at the Mayfair Kaikoura’s Ticket Counter in order to obtain a physical ticket for entry to the movie session/event. Alternatively, you may provide the credit card used to purchase the tickets for picking up the tickets at the Cinema. Tickets purchased via this website are sold for a specific session only and are sold on a strict no-refund no-exchange and no-transfer basis unless required by law. If the amount you pay for a ticket is incorrect (regardless of whether because of an error in a price posted on this website or otherwise communicated to you), or you are able to order a ticket before its scheduled on-sale or pre-sale date or you are able to order a ticket that was not supposed to have been released for sale, then Mayfair Kaikoura will have the right to cancel that ticket (or the order for that ticket) and refund to you the amount that you paid. This will apply regardless of human error or a transactional malfunction of this website. All pricing on this website is in New Zealand Dollars. Occasionally, events are cancelled or postponed by Mayfair Kaikoura. Should this occur, Mayfair Kaikoura will attempt to contact you and refund the amount as per the policy of Mayfair Kaikoura. 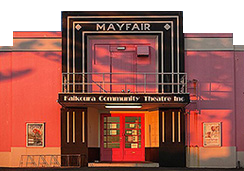 Mayfair Kaikoura may, at its discretion, refuse to sell tickets to you or withdraw any tickets from sale via this website. Mayfair Kaikoura reserves the right to change these terms and conditions or modify the website from time to time. The user shall be responsible for regularly reviewing these terms and conditions. When purchasing tickets through this website you must provide personal details, including credit card billing information. Your credit card details are used for real-time billing of ticket purchases and are not retained on our server. This information will not be shared, traded or sold to any third parties . We will record your email address if you transmit it to us electronically. Your email address will only be used for the purpose for which you provide it and will not be added to a mailing list unless you request that this be done. We will not disclose your email address without your consent. A fantastic community owned and run 1930's art deco building screening the latest blockbusters and popular movies. Also available for hire for functions, weddings and performances.